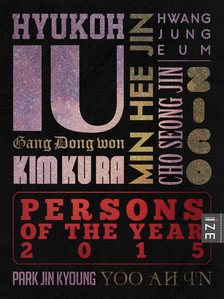 I thought everyone knew IU. The girl who sings “only this heart of mine, with no wrinkles remains shining brightly here”(’Heart’), the top star Cindy who hardens her heart to survive in the jungle-like entertainment industry (KBS ‘The Producers’), finally the skilful producer who convinces Park Myungsoo and composes ‘Leon’ (MBC ‘Infinity Challenge’ Music Festival), etc., in control of the entertainment industry in the first half of 2015, many saw her as intelligent and praiseworthy or the shrewd and cunning younger sister. But like IU said, “Being seen through the sunglasses, I’m used to it now”(’Twenty-three’). Becoming the nation’s little sister from her ‘3-level high note’, previously she felt puzzled by the way people looked at her, then “getting along well, quarreling, being sad and being thankful.. (having) a typical relationship” with her boyfriend, as much as she cherishes her own interpretation of creative works, she’s someone who can accept the fact that others have different perspectives from her. Also, at her recent concert, she sang ‘Zeze’ while commenting that it’s “a song she still loves as much as ever”. She’s not a doll that keeps smiling, but someone who is alive with her own thoughts and feelings. It’s as if she’s been shouting with all her might throughout the year. It’s possible that she may not be loved as widely as before. But no one can make judgements about her so easily anymore.